Benny! I was attending Syracuse University graduate school when his second album, Never Run, Never Hide, came out. The local FM rock station took immediately to playing "Mighta Been Love," which was all cranking guitars, catchy melody, chugging drums and opened up with those might words with just a mere bass playing: "I never run... I never hide." Bomp ! Bomp! " I can't remember the last time I cried... It might've been the day they took Elvis away." But then his equally catchy rock ballad about lusting after an underage girl caught on, "Into The Night" and it took Mardones to the top of the charts. This Mardones guy was on to something. In the city of Syracuse, this guy was becoming a god. The drums were recorded crisply, skipping a beat at the end of every other line. A clavinet and electric piano blending for the chords, tinkling downwards for effect. Heavily chorused rhythm guitar. Synth strings building each chorus up. And Mardones' masterfully belting it out. By the second verse, the last word of every other line overdubbed with breathy echoes ("he-e-e-eart"). Besides, the "Into the Night" chorus utilized one of rock's most powerful chord patterns -- F to G to Em to Am. Some years later, when I had my first home recording studio in my apartment, I did a version of this song with my friend John so he could impress the girls that summer in Fire Island. It was a little stiff because the drum machine was too rigidly programmed, but John gave it his all to hit those dramatic chorus high spots. 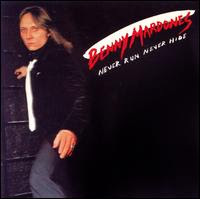 Now, by that time, Benny Mardones was the name of a guy who sang a song we all loved when we went to graduate school, a memory really. Until some Arizona DJ dug the song out of the vault, the phones went crazy and the song amazingly became a national hit all over again in 1989. And from what I read, Syracuse practically built a stature of Mardones in town. That's one of the funny things in rock and roll, when some random city embraces a musical act like nobody else, even if they are not from that town. Much like Crack The Sky and Baltimore, and Little Feat and Washington, D.C. The first video is a nicely done homemade video featuring old Mardones photos and record covers. The second is a entertaining promo for what was purportedly a 2002 documentary on Mardones' rise and fall with an absolutely priceless introduction. It's amazing that people still think that's what "Into The Night" is about...how many times does Benny have to tell the story? He's the one who said "She's just 16, leave her alone!"